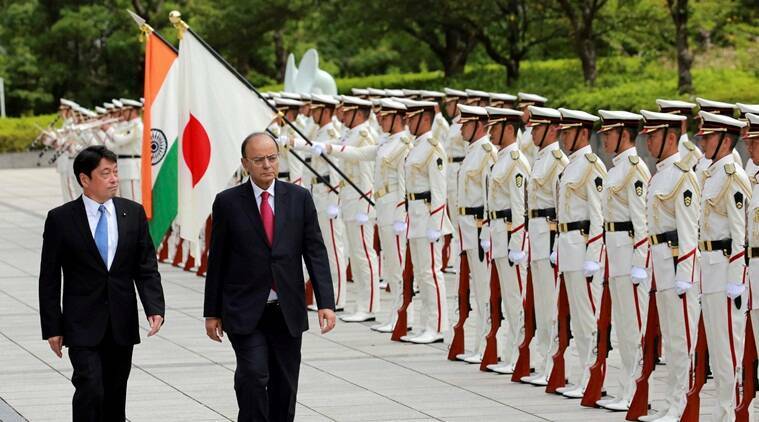 India and Japan have agreed to collaborate closely in defence production, including on dual-use technologies, as the two countries resolved to ramp up overall military engagement under the bilateral special strategic framework. Defence Minister Arun Jaitley and his Japanese counterpart Itsunori Onodera yesterday held wide-ranging talks, as part of the India-Japan annual defence ministerial dialogue in Tokyo during which issues relating to the US-2 amphibious aircraft also figured, a joint press statement said. The decision by India and Japan to boost defence ties comes amid escalating tension in the region in the wake of the nuclear test by North Korea and China’s growing assertiveness in the South China Sea. The two sides also agreed to commence technical discussions for research collaboration in the areas of Unmanned Ground Vehicles and Robotics. The two sides also agreed to ramp up counter-terror cooperation, besides deepening engagement among navies, air forces and ground forces of the two countries. “The Ministers exchanged views and ideas with the aim to further strengthen defence and security cooperation under the framework of the ‘Japan-lndia Special Strategic and Global Partnership’,” the statement said today. It said Jaitley and Onodera deliberated on the current security situation in the Indo-Pacific region and condemned in the strongest terms North Korea’s latest nuclear test and called upon the country to cease such action which adversely impacts peace and stability of the region and beyond. Reviewing bilateral defence ties, they commended the progress made in discussions to identify specific areas of collaboration in the field of defence equipment and technology cooperation for production of various military platforms. “They noted the effort made by both countries regarding the cooperation on US-2 amphibious aircraft,” said the statement. The ministers endorsed the importance of enhancing interaction between governments and defence industries of the two countries to encourage collaboration, including for defence and dual-use technologies. In the meeting, Jaitley briefed about India’s policy reforms in the defence manufacturing sectors, saying the country offers huge opportunities for foreign industries to play an active role. Seeking to further intensify naval cooperation, Onodera expressed his intention to have state-of-the-art Japanese assets, including P-1 maritime patrol aircraft to participate in next year’s trilateral Malabar naval exercise which also involves the US Navy. “The two sides will consider inclusion of Anti-Submarine Warfare (ASW) training to expand cooperation. In addition the ministers agreed to pursue exchanges and training by ASW aviation units such as P-3C,” the statement said. P-3C is an anti-submarine and maritime surveillance aircraft. The Japanese side proposed to invite Indian Navy personnel to mine-countermeasures training held by it. Jaitley attended the dialogue with Japan as defence minister though Nirmala Sitharaman was given the defence portfolio in the cabinet reshuffle on Sunday. Jaitley had said there were logistical constraints for her to attend the dialogue. At the talks, the two sides also welcomed the constructive engagement between Japan’s Acquisition, Technology and Logistic Agency (ATLA) and India’s Defence Research and Development Organisation (DRDO). The defence and security cooperation between India and Japan is on an upswing and both countries are exploring ways to further deepen it. Prime Minister Modi had visited Japan in November last year during which both sides had decided to ramp up bilateral defence and security cooperation.